​Today there are many reasons for people choosing a vegetarian diet: religious, ethical, environmental etc. Moreover, more people are now concerned about their health and becoming more aware about the health advantages of a plant-based diet that is rich in unprocessed whole foods. So what are some benefits of following a vegetarian diet for your body and mind? Consuming healthy foods makes you feel good and more energized. Putting processed foods that are full of sugar and white flour into your body, makes you feel de-energized and tired. Rapid fluctuations in blood sugar levels result in energy outbursts followed by extreme tiredness. Eating unprocessed foods that are high in fiber lets blood sugar levels increase and decline slowly and steadily. 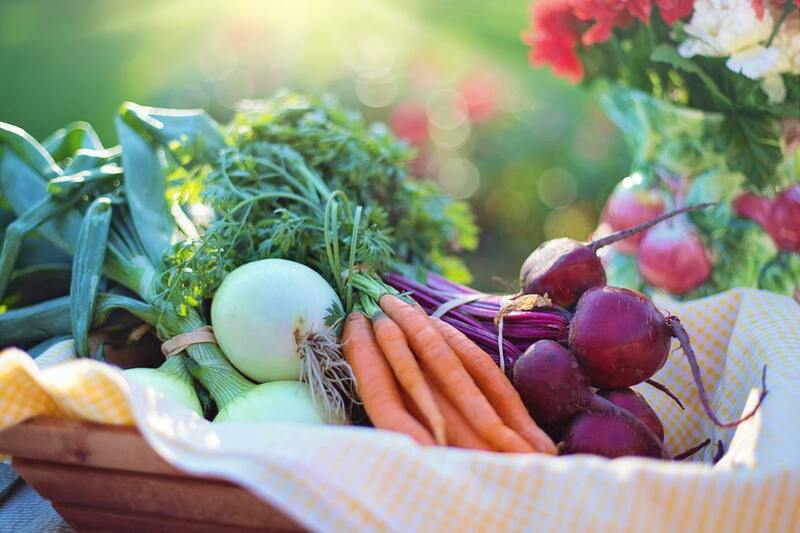 While vegetarian diet improves internal health, eating the right kinds of foods also results in external benefits – our skin reflects what is going on inside our bodies. Many vegetables and fruits are rich in vitamin C, which is a powerful antioxidant. Fueling your body with colorful plant foods helps stimulate collagen production and reduce wrinkles. Plant-based foods contain loads of healthy fats, vitamins, minerals, and phytochemicals, which all support healthy hair, nails, and skin. Eating meat has been linked to obesity. A vegetarian diet helps to achieve or maintain your goal weight. Plants are high in fiber and water, thereby making you feel full for longer periods of time. Due to the high dietary fiber content, your digestion is likely to improve and cholesterol levels normalize. Further, though plants are low in calories, they are loaded with the important nutrients. Plant-based foods also contain many of the essential vitamins and minerals necessary to keep the body functioning optimally. Deficiencies can often leave us exposed to sicknesses that could be easily prevented by eating a healthy diet. Research shows that people who follow a plant-based diet have a lower risk of diseases like heart disease, diabetes, and cancer. A plant-based diet that is whole foods focused, helps keep blood sugar levels stable is one of the best defenses against diabetes. Maintaining a healthy body weight and fiber-filled, antioxidant-packed diet is also the key to reduce the risk of cancer. Plants are naturally low in “bad” fats. Basing your meals around vegetables, whole grains, fruits, and legumes lowers blood pressure and improves cholesterol thus also reducing the risk for heart attacks. In addition to all the health benefits above, reducing your meat consumption or choosing a vegetarian diet allows you to discover and experiment with new and exciting recipes and brings more food diversity into your diet. Plant-based diet can be so much more flavorful and not at all boring - one great way to add variety to your dishes is with spices. However, it is important to eat all kinds of plant-based whole foods from different food groups to get the essential nutrients and vitamins. There are many interesting documentaries we would recommend watching if you would like to educate yourself on the subject more thoroughly. Movie recommendations: Forks Over Knives, Food, Inc, What The Health, Vegucated, Food Matters, and Fat, Sick & Nearly Dead. 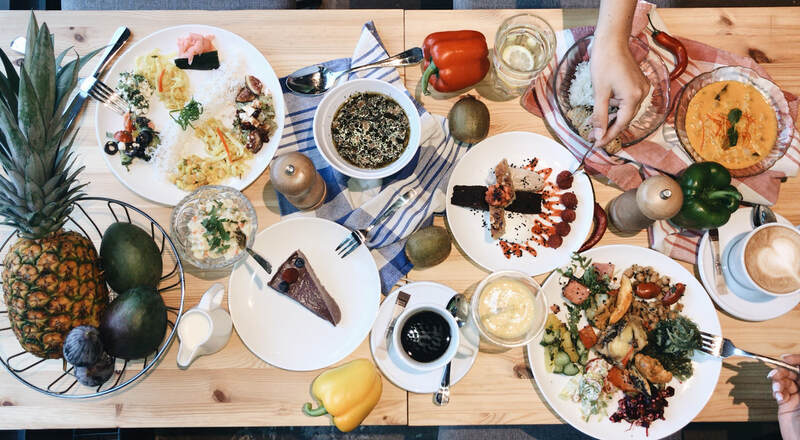 BlissTray is the only restaurant in Estonia, where you have a unique opportunity to put together a vegan or a vegetarian meal while taking into account your own personal taste and appetite. Since the counters are full of appetizing dishes, a real danger of eating too much remains. Bliss’ food is just too good. Although BlissTray is focused on offering their clients healthy food, a seemingly hearty meal may not be good for you, if eaten too much. Remember- balance is the key. Here is a short helpful list of tips, how to create your healthy #MyBlissTray! Bliss helps you escape from your fast everyday life in the best way possible. You will return as a happy person to continue your daily chores. They say: ''The way to a man's heart is through his stomach'', and we know for sure that love is the thing what makes us happy. You will find rich colorful food counters in BlissTray restaurant, what will blind you with the choice and make your mouth water from the first sight! Be aware! There is a danger to overeat vegan and vegetarian foods. For a full-valued experience and taking your personal preferences into consideration, we have pieced together a guide. It won’t just make your lunch a simple taste experience, but also supports Your body, health, and spirit. Since the choice of food is wide, you can create a real piece of art on your plate, using these tips. It will be good for you, tasty and look amazing. A real dream coming true! 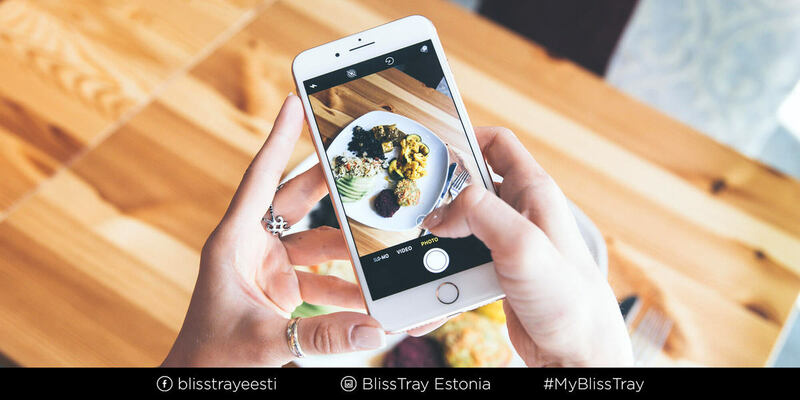 To create your favorite #MyBlissTray, we have already provided one of the most important factors - a large range of delicious food is already waiting on the counters for eager eaters. But before diving in, you should be aware of how to eat healthily! First of all, you should divide the area on the plate into sectors. That way you can style a tray, basing on your favorite preferences of food. #1 Vegetables and fruit are the base! The largest area on the plate should be covered with vegetables and fruits. The goal would be to create a rainbow. That means a tray could be filled with as many different fruits as possible, representing different colors on the color chart. BlissTray provides a wide selection of hot oven baked vegetable dishes and casseroles, as well as cold vegetable and fruit salads. #2 All fats are NOT healthy! There is a common misconception going around, that fats raise the weight. In fact, fats are necessary for life, because they are the source of irreplaceable fatty acids. You only have to choose the ones that haven’t lost their value during processing. Also, you shouldn’t get carried away. Raise on the plate one or two tablespoons worth of fats. The best sources of vegetable fat are seeds, nuts and fatty "vegetables" such as avocado and olives! #3 Carbs don’t make you fat! One-eighth of a plate should be filled with cereal products and starchy vegetables. For your body, carbohydrates are the main source of energy. They typically cover about half of the body's energy needs. It is often implied that eating carbohydrates makes you gain weight, and therefore people have started to restrict eating such foods as rice or potatoes. In reality, they have a significant part to play in fulfilling the most important task in our bodies: giving us energy. Your body will say ‘Thank you’ and do a curtsey when you give it fiber-rich foods which also contain vitamins and minerals. Carbohydrates also have an important part in a well-balanced and a healthy diet. 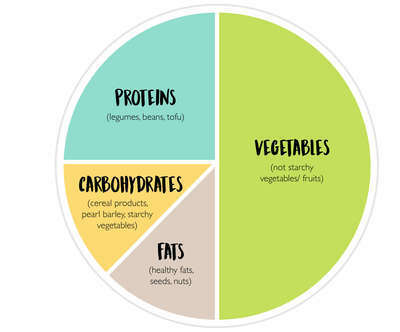 For example, fiber-rich foods are buckwheat, couscous, grits, rice (especially wholegrain), quinoa, whole-wheat pasta, as well as starchy vegetables such as potatoes and sweet potatoes. #4 And where do you get protein? 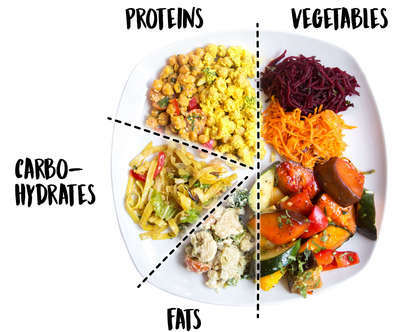 ​The last, sad and empty part of the plate should be covered with healthy vegetable protein sources. When discussing vegetarianism and vegan food, supporters of this lifestyle are often questioned: if you do not eat meat, where do you get the protein? The best vegetable protein sources are all legumes: beans, peas, and lentils, as well as tofu. Therefore, no meat is needed! ​Will You be able to assemble a nutritious #MyBlissTray? BlissTray restaurant is the ideal place to dine. The selection includes a wide range of vegan as well as vegetarian dishes. You can make your decision by listening to your inner voice. Doing so, you won’t overeat and stay whole in the paradise called BlissTray. In Bliss, we follow the ancient Ayurvedic knowledge for how to balance our choice of foods. Carefully selected food products can significantly improve your digestion, support the body's nutrition at a deeper level, and have a positive effect on the health in whole. Delicious food is not only for our body, but it also feeds our senses. And if you feel like you forgot to try something, in particular, do not worry! We are always waiting for your return and guarantee that you will receive special food experience at any time! Wait and see how you inspire others!